About 1300 years ago, imperial consort Yang Guifei was renowned as much for her appetite as for her beauty. A plump favorite of the Tang Xuanzong emperor, it is said that she loved lychees with such passion that a relay delivery system was set up by the emperor to quickly transport these fragile tropical fruits from southern China to the capital - Chang'an - in the north so that they were fresh enough to please this lovely lady. If you've ever had a perfectly ripe lychee (or litchi), you'll understand. They are the most remarkable fruit, and even if you don't have a pony express at your disposal, they certainly are worth seeking out. Taiwan has the most perfect lychees I've ever tasted, and I was always more than willing to put up with the excruciatingly humid July weather just to be able to gorge myself on as many of them as I could cram into the fridge. When they are at their pinnacle of ripeness, lychees have a delectable sweet and sour taste that - believe it or not - feels like it is gently carbonated, as it sparkles on the tongue and amplifies the haunting aroma. This rapturously delicious fruit is only in season for a very short time, but fortunately in California, they are becoming more and more common as each summer rolls around. A few years ago, the only ones available were from China or Taiwan, but then Israel started producing them, and now Mexico is growing some fat little fruits that are really quite good. So, if you see them in the market, try a couple. The fruit should be a mottled red and green, and the skin must be soft enough to squeeze without cracking; this shows that they are still fresh, while hard skins tell you that the fruits have been hanging around for a while. Perfect lychees have a bright fragrance about them that is almost perfumey; if they don't smell gorgeous, they won't taste gorgeous. The best way to eat ripe lychees is to rinse them, shake off most of the moisture, and chill them in a plastic bag. Then, peel the leathery skin off, nibble around the pit, and enjoy one of the best flavors on this good green earth. If the fruits are only so-so, or if you can't find fresh ones and need to use canned (which aren't that bad, really; Taiwan has some excellent brands), try this refreshing summer jelled dessert that hails from Chuanzhou. Meaning "land of springs," Chuanzhou is a coastal town right above Xiamen in southern Fujian and just across the straits from Taiwan. 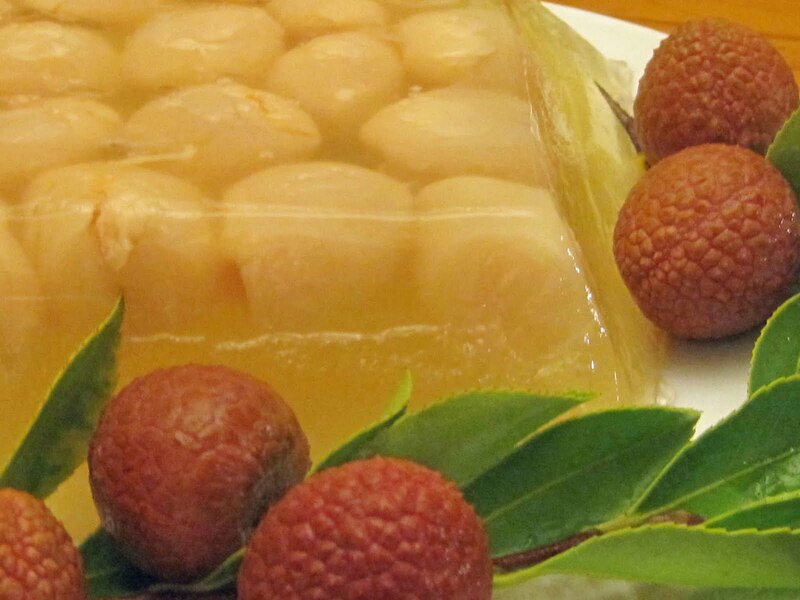 Fujian - as well as Taiwan, Guangdong, and other southern regions - is renowned for its delicious lychees, and this dessert does the local fruits justice. It is simplicity itself: just pitted fruits, gelatin, sugar, and water. If you are using canned fruits, you can even use the light canning syrup in place of some of the water and sugar. Traditionally this is made with agar, but gelatin gives this a more tender texture, in my option; feel free to use agar if you prefer. This dish can easily be made ahead of time, and it can be as fancy or as simple as you like. If it's just for family, you can skip the molding and just add the fruits to the gelatin mixture before chilling; it's not as pretty, but it tastes perfectly delicious! 1. Chill a 5- to 6-cup container in the freezer while you prepare the rest of the ingredients. 3. Soften the gelatin by placing it in a medium work bowl and pouring ¼ cup cool filtered water over it. Boil the rest of the water. Add the sugar to the softened gelatin and stir in the boiling water to dissolve both the gelatin and sugar. 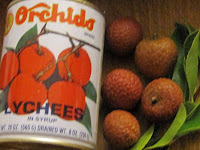 (If you are using canned lychees, use all of the syrup; measure the syrup and add enough water make 4 cups liquid. Taste the liquid and add more sugar, if needed.) Allow the liquid to come to room temperature and add the lemon juice. 4. If you have some fresh lychees available, reserve about 6 of the prettiest lychees unpeeled as a garnish. Arrange the rest of the lychees in the bottom of the chilled mold so that the cut sections face the inside. (This way you will have only smooth, rounded surfaces showing when you unmold the jelly.) Pour a thin (½ inch) layer of the gelatin over the fruit and immediately refrigerate the mold for about 10 minutes, or until the gelatin has solidified. Pour the rest of the gelatin into the mold, cover, and refrigerate the mold for a few hours to give the gelatin the chance to firm up. 5. Just before serving, run warm tap water over the bottom of the mold to loosen it. Gently shake the mold and place a serving platter over the mold. Swiftly turn the mold over onto the plate, gently shake it again, and the jelly should plop down onto the serving plate; if it doesn't, run more warm water over the outside of the mold. Garnish the jelly with the reserved lychees. Clean and dry some citrus leaves, if desired, and arrange them around the jelly. Serve immediately.